Park visitors in Florida walk through the parks on sturdy 8-foot-wide paths. The paths were installed with Porous Pave XL, a pour-in-place permeable paving material. 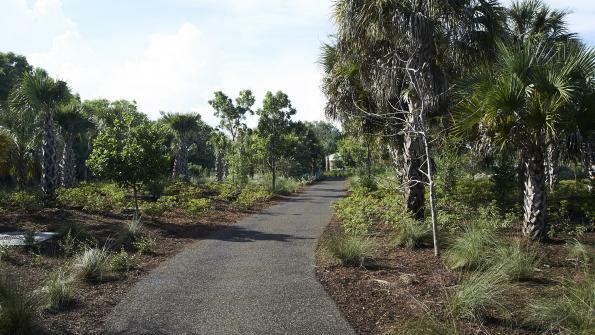 Visitors walk and bike through Cypress Preserve and Oak Hammock parks in Sunrise, Fla., on sturdy 8-foot-wide paths. The paths were installed with Porous Pave XL, a pour-in-place permeable paving material from Porous Pave of Grant, Mich. The project was completed September 2015. Eco Engineering Service, a contractor based in Hillsboro, Fla., poured 2 inches of the material atop a 2-inch base of washed #57 limestone. The photo at the right show the Sunrise, Fla., park paths before the Porous Pave XL paving material was installed. Sunrise is located between Fort Lauderdale on the east and the Everglades Wildlife Management Area to the west. Onsite stormwater retention to decrease water pollution was one of the reasons why the city’s Public Works Division chose the paving material. Made from 50 percent recycled rubber chips and 50 percent kiln-dried aggregate with a moisture-cured liquid binder, the material can infiltrate up to 6,300 gallons of water per hour per square foot. The paving material is resilient and slip-resistant. The Sunrise parks have parking, paved paths, picnic pavilions and playgrounds. Cypress Preserve Park (8 acres) offers a 9-hole disc golf course and a spray-ground with a splash pad. Its permeable paved path is one long loop around the park with a central connection. At Oak Hammock Park (12 acres), the paved path leads to a nature observation boardwalk over a canal. Monies from a People for Parks grant from Broward County, Fla., fund operations of the parks. Go here for more information on Porous Pave.